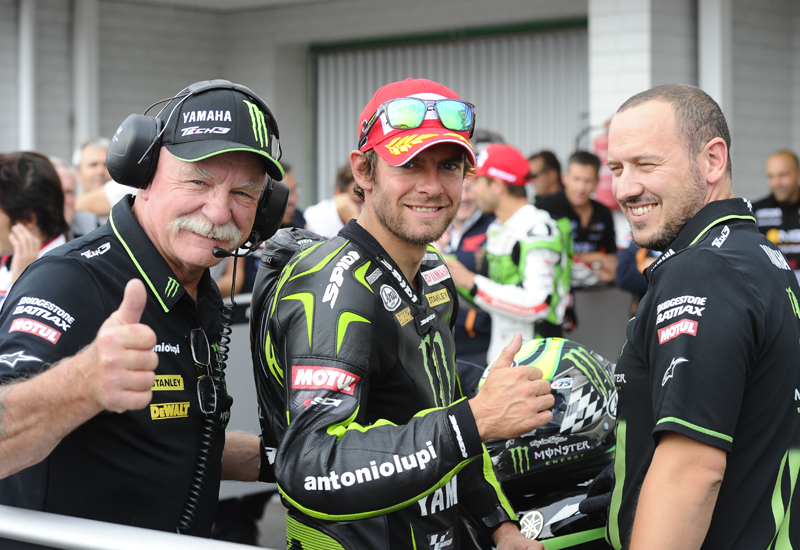 Cal Crutchlow’s reckons his record breaking second MotoGP pole position of 2013 in Brno was sweeter than his milestone first pole in Assen earlier this season. When the Monster Yamaha Tech 3 rider became the first British rider in 11 years to take a premier class pole in Holland in late June, he achieved it with reigning world champion Jorge Lorenzo absent with a broken left collarbone. But in the Czech Republic, the grid was at full strength and Crutchlow delivered a sensational performance to become the fastest man ever on two wheels in Brno. The 27-year-old’s personal best lap of 1.55.527 put him over 0.2s clear of the field and broke Lorenzo’s 2012 pole position record of 1.55.799. Crutchlow has fond memories of the Brno track, as it was at the Czech track a year ago that he scored his breakthrough first MotoGP podium. But he said the track wasn’t a personal favourite and his focus tomorrow will be ensuring he can stay in the fight for an historic career first win until the decisive final stages. He added: “It is really funny because I would say my style is not suited to long corners. The Yamaha is but even in World Supersport and World Superbike I did a good job here. It is not a track where I think I am going to do really well here but it is just one of those things where I seem to have good lap times and good races here. Hopefully the rain will hold off and we can have a good clean race because there are so many people that are able to challenge at the front. It is a long race and hopefully we can have a good battle.